The naturally aged look of Corten Steel garden planters makes it one of the newly popular materials for garden planters and pots. A long lasting steel that has a weathered look from new, but stays that way. Corten Steel is a low maintenance solution for a strong architectural look in planters, for both commercial and domestic use. Coming in a thickness of, 1.6mm, 3mm and 6mm Corten is a copper chromium alloy steel. For planters the 3mm is most commonly used and as with all garden pots they come with drainage holes, in general liners are not needed. Standard sizes are available from a number of suppliers, while custom made sizes and shapes can be made to fit many landscape designs. Custom made sizes are usually laser cut, and within limits almost any size or shape can be manufactured. 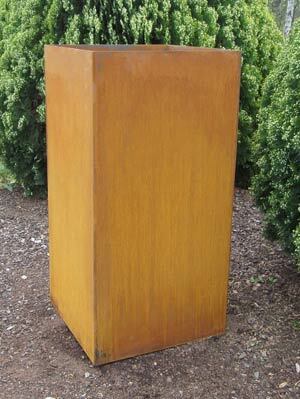 Do these steel planters require any maintenance, well not really although some designers have used a light coating of oil to slightly alter the look, this would need to reapplied every year. As with real rust it will leach, especially over the first year and this can stain. The patina of age will develop over time, and is this steel tough, yes, it has even been used to clad buildings. Custom designs can include laser cut patterns, rounded forms and raised planters as well. Larger forms used in landscaping may be constructed with sides only to decrease weight and cost, liners can also be installed if required. Greenlines Gardenware exclusively sells the unique and innovative garden edging system that lets you be the boss of your landscape design. FormBoss is a durable & sturdy edge that can be formed to any shape on your plan, creating the whole shape and feel for your garden.